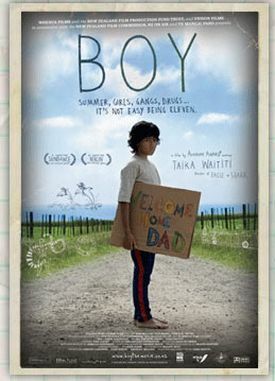 Set in 1984 in the ethnic poverty of a remote corner of New Zealand, Boy, the second feature by the Maori director Taika Waititi (Eagle vs. Shark), inevitably brings to mind the first feature by the great Frenchman, François Truffaut. That was Les quatre cents coups (The 400 Blows) of 1959, which did so much to launch the French New Wave. Let’s hope that Boy proves to be similarly seminal in its influence. Both films take a Dickensian, child’s eye view of a fatherless boy’s search for masculine models that is at once hilariously funny and heart-breaking. Both films, too, have a freshness and vitality to them that makes one forget — at least it makes this one forget — everything one has seen on the subject before. That it presents this kind of challenge to the adepts of intertextual criticism is an additional recommendation in my book. At the same time, I can’t help contrasting Mr Waititi’s picture with that of his great predecessor in at least one important respect. Antoine Doinel (Jean-Pierre Léaud), the 14-year-old hero of Truffaut’s film is bewildered by and shut out of the adult world, and he comes to take up an adversarial attitude towards it, but the 11-year old Boy (James Rolleston) of the New Zealander’s film hardly even knows that that world exists. Perhaps it doesn’t anymore. Unlike Antoine, he has a father, albeit an absent one, who goes by the name of Alamein and is played by Mr Waititi himself. When Alamein is released from jail, he turns up with two unsavory-looking pals at the ramshackle house near the beach where Boy lives with his grandmother, his younger brother Rocky (Te Aho Aho Eketone-Whitu) and cousins, and we soon realize that he is more immature than his son. He and his two friends style themselves as members of a gang called Crazy Horses, and they are searching for some money that Alamein says he buried nearby before he went to jail, though he can’t remember exactly where. Boy’s fantasies about his father when absent are, like the father’s name, redolent of a past heroic age that has now grown so vague in the memory that it has become mixed up with pop cultural detritus like E.T., which is dad’s favorite movie, and Michael Jackson, who is Boy’s biggest hero — next to his supposedly heroic dad. The movie begins with an epigraph from E.T. : "You could be happy here. We could grow up together." Thus does Mr Waititi introduce us to his modus operandi, which is to turn Hollywood schlock into nearly unbearable poignancy through the magic of cinematic irony. If the film has a fault it is the sketchiness of its story-line, although it is given some shape by the framing device of having granny leave the kids alone to go to a funeral in Wellington at the beginning and her returning at the end with Dad’s momentous visit contained inside the frame and so taking place entirely, and appropriately, within the children’s world. Hanging over the film throughout, however, is the reality principle in the shape of memories of Boy’s mother who died six or seven years earlier in giving birth to Rocky. The latter dispassionately informs a local man whom the boys call Weirdo (Waihoroi Shortland) that "My mum’s dead. I killed her." This may be what makes him think that he has special powers, like a superhero, that he is both wary of and fascinated by. The movie occasionally indulges him in his fantasy, as it does Boy and his father in theirs, but the boys if not their father are still sufficiently in touch with reality not to become the prisoners of their own dreams. The ending is ambiguous but it allows us to indulge our own fantasies of Alamein/E.T.’s permanent return to his home planet and something like the responsible fatherhood of which we would otherwise think him incapable. Likewise, Boy’s dreams of dancing like Michael Jackson — perhaps a bit fantastical in this particular setting, as well as being themselves fantasies of another world — are alluded to in the movie’s final scene, which consists of a version of the Maori war dance, the Haka, as done by the whole cast to the late Mr Jackson’s "Thriller." To me that was the one wrong note in this otherwise entirely delightful movie which ought at least to emulate its hero in showing that it knows the difference between fantasy and reality — and where to draw the line between them.